William Myles became one of Dundee's most highly regarded accountants during a career spanning almost half a century. He numbered many companies and noted individuals among his clients. Latterly, his nephew, David Myles became a partner in his business. Established Church. Known to have worshipped in the South Church. Latterly, he became a member of St Mark's Church, closer to his residence. It was reported that William Myles took no part in public affairs. Coming as he did from near Cortachy, north of Kirriemuir, William Myles, as a youth, entered the office of Mr Nicoll, then factor for the Earl of Airlie. Subsequently, he went to Edinburgh. William Myles' working life in Dundee began circa 1835 when he held the office of accountant within the branch of the Royal Bank there. Some years later,circa 1839, he worked as an accountant with John Bell, writer, in Castle Street before setting up practice on his own account from 11 Reform Street. His business remained at that location for the remainder of his working life. William Myles was one of nine children born to Robert Myles, a farmer, and his wife, Catherine Ramsay. 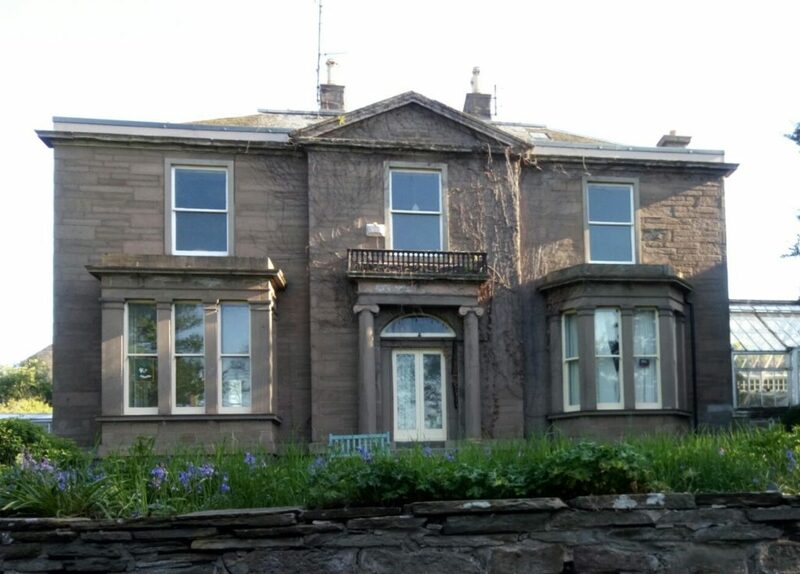 His father, Robert, was a life tenant of Hillend and Redhall, on the Airlie estate, near Cortachy. Having first been taken into the office of the estate factor, William subsequently went to Edinburgh. In the second half of the 1830s, William Myles was employed as an accountant within the newly opened branch of the Royal Bank of Scotland in Dundee, before joining the office of John Bell, writer, in Castle Street. 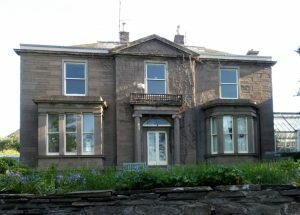 Over a period of forty years, William Myles developed ‘a large and most respectable business as accountant.’ It was reported that his ‘remarkable sagacity, energy and probity soon garnered a sizeable clientele and, from then, he carried on a large and successful business,’ claiming clients from the most influential companies and families in Dundee. By 1867, William Myles assumed as his partner, Mr David Myles, his nephew. David had long been associated with his uncle in the carrying out of business. Their firm was titled ‘W & D Myles,’ accountants. David Myles went on to forge an even more successful career than his uncle. It was stated that ‘in his uncle’s (William) time, there was no important bankruptcy in Dundee or indeed in Forfarshire with which the firm was not connected and, since then, the confidence which professional and other men reposed in his uncle (William) was extended to Mr (David) Myles.’ It would appear that integrity and a sound work ethic sustained William Myles throughout his life, working, as he did, until shortly before his death. William Myles died at the home of his late brother, John, at Balwhyme, near Alyth. An unmarried gentleman, William Myles made provision for his remaining siblings from his amassed estate of over £21,000. Old Parish Registers. Kirriemuir. Births. (1806). 299/ 20 241. Scotlandspeople website. Dundee Postal Directory, 1869-70. p.184. Dundee Central Library, Local Studies. Dundee Postal Directory, 1878-79. p.226. Dundee Central Library, Local Studies. Statutory Registers. Alyth. Deaths. (1879). 328/ A 35. Scotlandspeople website. 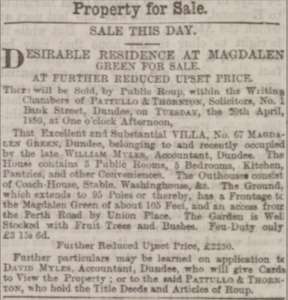 Dundee Advertiser, 12 August 1879. p.10. Findmypast website. 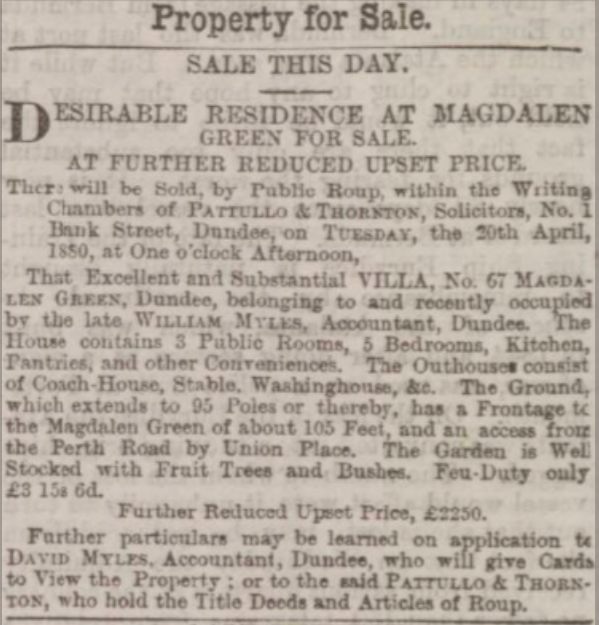 Dundee Evening Telegraph, 9 August 1879. p.3. Findmypast website. Dundee Postal Directory, 1867-68. p.174. Dundee Central Library, Local Studies. Dundee Postal Directory, 1846-47. p.146. Dundee Central Library, Local Studies. Dundee Postal Directory, 1837-38. p.60. Dundee Central Library, Local Studies. Dundee Postal Directory, 1842-43. p.61. Dundee Central Library, Local Studies. Dundee Postal Directory, 1845. p.67. Dundee Central Library, Local Studies. Mitchell. Alison (ed.). Pre 1855 Gravestone Inscriptions. Angus. Volume 1. Strathmore. p.221. The Scottish Genealogy Society. Dundee Courier, 8 June 1898. p.4. Findmypast website. Legal Records. Wills and Testaments. Dundee Sheriff Court. (1879). SC45/31/29. Scotlandspeople website. The information above about William Myles has been collated from a range of digital and hard copy sources. To the best of our knowledge it is correct but if you are relying on any information from our website for the purpose of your own research we would advise you to follow up the sources to your own satisfaction. If you are aware of an inaccuracy in our text please do not hesitate to notify us through our Contact page.